We have packed the 20 .kml files for GE in one .zip file for easier and faster download. 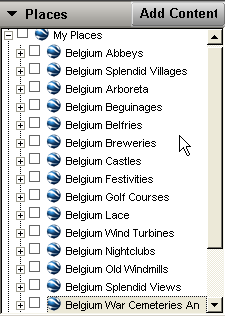 We have added "Belgium" in front of every file so that, if others undertake the same work for their country or region, the files for every country/region will be easily distinguishable in GE. Example: FranceNorthAbbeys.kml tells exactly what and where. All unzipped? And you know where they are on your hard disk? Let's launch GE. 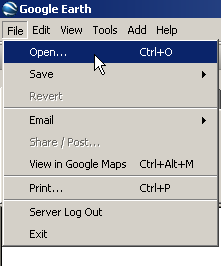 In GE we click File, then Open. This opens the following window. We have selected the folder where the files are situated. Now comes a trick. On the PC press and hold the Shift key. Click on the first file in the list (Abbeys). This will be highlighted. Keep pressing the Shift key and move the cursor over the last file (War Cemeteries And Memorials). All files will be highlighted. Now click "Open". 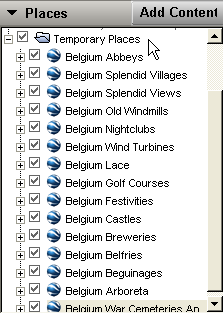 All files are loaded at once and GE places them in "Temporary Places", as can be seen in the screen shot below. If this does not work, you can always load them one after another into Google Earth. 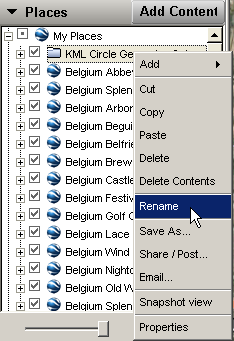 Later when you want to close GE, the program will ask you whether you want to save these files to "My Places". 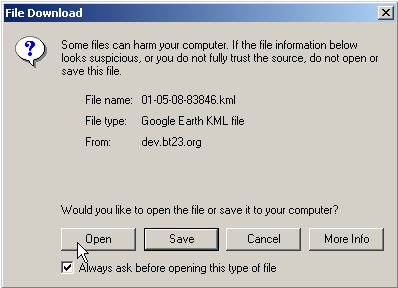 If you answer "yes" the files will always be available, every time that you open Google Earth. Now your screen should look like in the picture above. Time to play with the different files and to get customized with our Icons. If you toggle On/Off, On/Off, etc. category after category, you will very quickly be able to recognize all different categories by their own Icons. How to draw a circle in Google Earth? As far as we know this can not (yet) be done directly in Google Earth, but there is a simple solution for this problem. 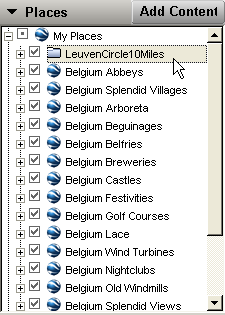 Let's suppose that you will stay some time in Leuven and want to find out what you could visit in a circle with a radius of 10 miles around the center of Leuven. In GE we Fly To "leuven". Than we put the cursor on the indicated center and read in the lower left corner of the screen "Pointer lat 50.879268° lon 4.702139°". We note these GPS-Coordinates. It will be advisable to put a shortcut to this site on your desktop, as you will probably use it often more in the future. Here we enter the GPS-Coordinates and the radius of our circle in meters! One mile is about 1.61 kilometers, so for a 10 mi radius we have to enter 16100 meters. 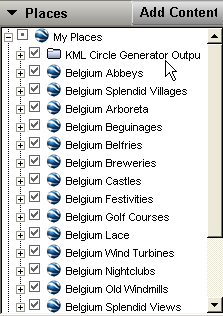 Early 2011 we discovered that the KML circle generator did not function anymore. Here you can download the program GEPath for free. 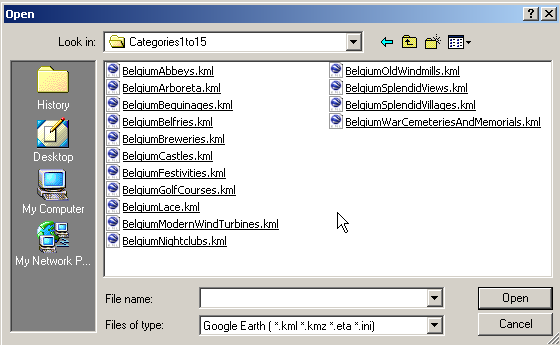 With this program you can draw Circles for Google Earth and much more. Now you can investigate what you would like to visit. Hover the cursor over some Icon or its number to know exactly which POI you see. You can zoom in more, if you like. And, of course, you can drag the whole with your left mouse button. Don't worry about the Circle(s). As you can see the circle is drawn from a .KML file and saved with the other .KML files. This means that you can Toggle it On/Off, Delete it, or Rename it. Here we gave it a more meaningful name, so we don't have to delete it and can reuse it, whenever we want. Go to "POIs in GPS Navigator" if you are ready to install the POIs to your GPS Navigator. 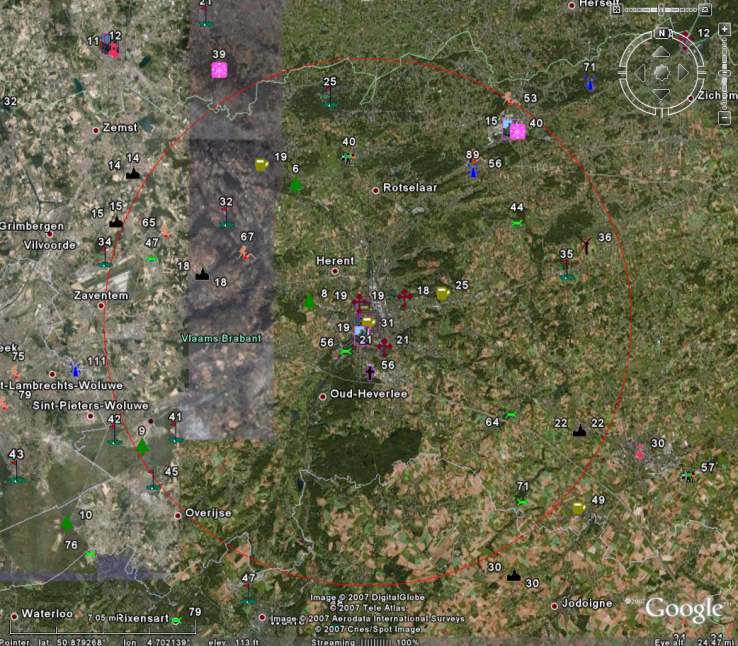 Return from "Google Earth and POIs" to the "All POIs Together" page. Return to the "Google Earth Introduction" page.